In April of 1927, a group of eight men met to discuss the possibilities and advisability of starting a new fraternity at Rensselaer. Much enthusiasm was shown and the group decided to go through with the project. A month later, the group grew to fourteen men and was incorporated under the laws of the State of New York as the Theta Delta Psi Fraternity which soon changed its name to Sigma Zeta. 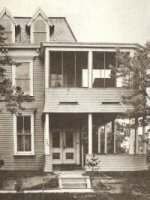 By the end of the academic year, a house was leased on Eighth Street. The membership grew so rapidly that a larger house was necessary in a year. In the fall of 1928, the fraternity moved to 2209 Sixteenth Street. In 1930, the chapter was admitted into the local Interfraternity Conference. After 1930, Sigma Zeta went into a decline. Members of Theta Chaper thought it best to withdraw. The fraternity felt, however, that returning to the status of a local was a step in the wrong direction; so it welcomed the opportunity of petition to Theta Upsilon Omega. Founder and Grand Secretary William L.
Theta Upsilon Omega had been founded through an agreement between local fraternities at different universities. Their common interest in forming a new national organization was realized at a conference in New York City in 1923. Twelve of the chapters present at the conference came together to draw up and sign articles of agreement, which led to the founding of Theta Upsilon Omega in Lewisburg, Pennsylvania, in February of 1924. This new fraternity was made up of nine of the original twelve chapters, and one additional chapter. Members of Rensselaer's former Sigma Zeta fraternity became inducted into Theta Upsilon Omega on September 23, 1933. The house was designated the Theta Beta chapter under its new national leadership. During the summer of 1935, the chapter moved to a new location at 2256 Burdett Avenue. On April 23, 1938, the New York Delta chapter of Sigma Phi Epsilon was founded, following a successful merger between the national organizations of Theta Upsilon Omega and Sigma Phi Epsilon. 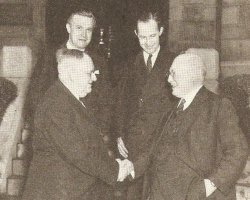 A vote had been held in January of 1938, and both fraternities believed that they shared many of the same values, and that coming together would cause both to become stronger and more successful. During the months of April and May, the following 7 chapters were inducted into Sigma Phi Epsilon. The summer following the merger, New York Delta chapter moved back to the old location on Sixteenth St. 22 years later in the summer of 1960, the chapter moved again, this time to our current location at 2005 15th St.